Houses & Homes VA: When did working on Christmas become the norm? 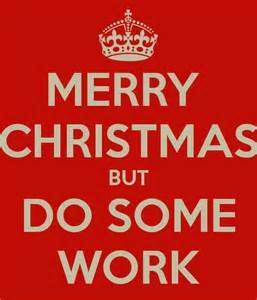 When did working on Christmas become the norm? Am I the only one that feels this way? I was quite surprised to discover just how many Americans had to work on Thanksgiving Day and will work this Christmas as well. Is this normal now? When I was a little girl working on the holidays was almost unheard of in most professions. Clearly there are people that must work regardless of what day it is such as firefighters, police, doctors, etc. but is it really necessary for most people? Traditionally convenience stores and gas stations have always remained open for the holidays but even that has been a controversy for a long time. Now, the requirement to work on holidays has spread to many other industries that at one time were not open for business on these special days. This year a full ¼ of American workers are expected to report for work on at least one of our nation’s biggest holidays (Thanksgiving, Christmas Day or New Year's Day) and most of them are not very happy about it. There’s also been a growing trend to open earlier than usual on these days as an added “convenience” to the customer and to work later as well, but these changes are not going unanswered. An increasing number of employees are filing grievances with their employers regarding the changing holiday schedule and more than one petition has been started demanding a change in policy. But will this make a change? It’s doubtful to say the least. It is the customer that drives these changes and as long as everyone keeps “popping in” to their local 7-11 for a quick coffee on the way to Aunt Minnie’s house on Christmas Day there will be no change in policy. Since we all agree that this is the time of year for goodwill and cheer towards our fellow man (and woman) maybe we should consider filling up the tank and buying milk and bread the day before Christmas this year. If there’s no demand on holidays than it’s a guarantee that non-essential businesses will close on those days. Maybe that’s a great gift we could give to all of the service workers that do so much to make our lives a bit more convenient year round.